You can have your cake (or better yet, pie) and eat it too! And in this case, without a tiniest sense of guilt. And also, who says you can’t have pie for breakfast? Of course you can! This lovely galette here is completely sugar and gluten free, and if you swap the greek yogurt I topped it with for some coconut cream for example, it is vegan too. 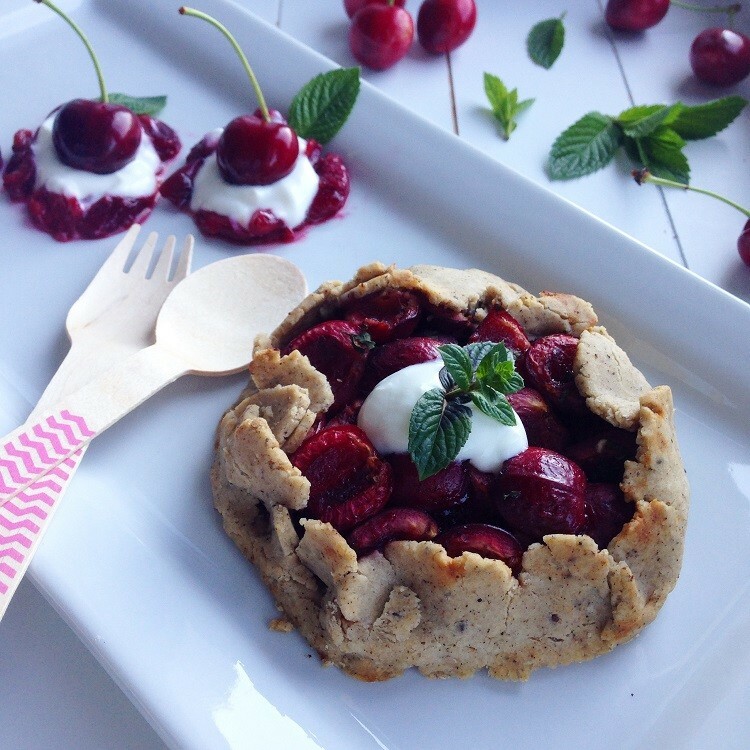 So there is no reason for you not to have it for breakfast or, of course, as a lovely dessert in the afternoon, idealy in the shade of a cherry tree in your garden from which you’ve just picked the cherries that are in this galette. 1. First prepare the crust. Place all ingredients except water in a bowl and start kneading. Slowly add cold water, almost drop by drop (I add it by watering my fingers while kneading) until firm dough forms. Wrap it in some foil and place in the fridge for at least 15 minutes. 2. Meanwhile preheat the oven to 190 degrees Celsius and prepare the filling. 3. Place all filling ingredients except mint leaves in a bowl and mix well. Chop a few mint leaves (to taste) and mix them in as well. 4. Divide the dough in four and roll out each part into a circle (a few milimeters thick) between two sheets of baking paper. Move the dough with the baking sheets underneath onto baking trays (it is easier to do it now that later when the galettes are all heavy from the filling) and start filling them with cherries. Leave a few centimeters on the sides so you can then fold them up, slightly covering the filling. 5. Bake for 30 – 35 minutes, until the crust starts to brown. 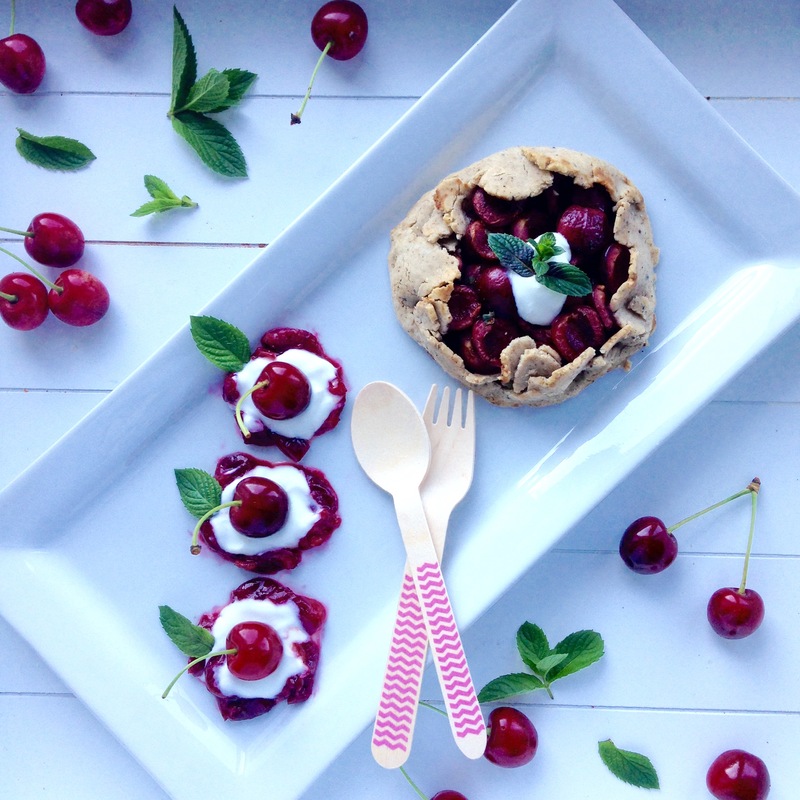 Serve warm with cooked cherries and greek yogurt/coconut cream.